When Jim Officer told me a few years ago that he planned to retire as Head of St. George’s School of Montreal once he handed his youngest daughter, Eugénie, her high school diploma, it was very obvious what the theme would be for his well deserved gala farewell. For Jim is indeed “An Officer and a Gentleman,” and last Wednesday evening at Le Windsor several hundred people applauded his 40 plus years as a seasoned educator. You remember the movie and that famous scene from the 1982 motion picture An Officer and a Gentleman, where Richard Gere marches into a factory and carries Debra Winger out in his arms to the tune of the hit Joe Cocker-Jennifer Warnes song Up Where We Belong? 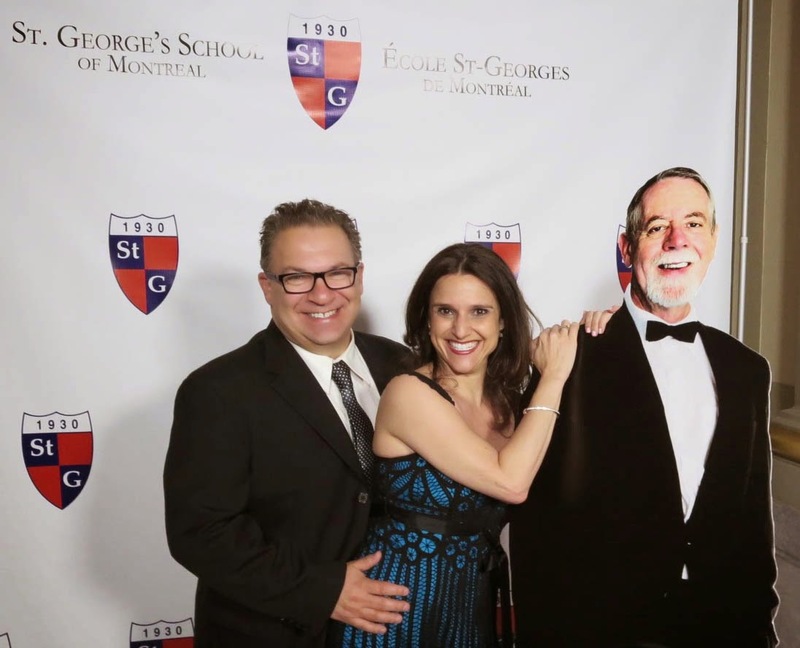 Well, Jim did not quite do the same last week with his wife Nathalie Bossé, St. George’s Assistant Head of Curriculum and CLE, but he did wear a white tuxedo jacket – similar to the Gere navy pilot character's neat white suit. Officer has headed St. George’s for the past 21 years, working for the former Protestant School Board of Greater Montreal and at McGill University before that. Attendees at last week’s gala were greeted by a pack of “paparazzi," who were in fact St. George’s senior students acting proudly as volunteers for the event. Inside the grand halls of Le Windsor, attendees were then invited to take a cutout picture with the guest of honour in front of a “step and repeat wall,” replete with the St. George’s logo and crest. In addition to his wife and youngest daughter, Officer was accompanied to the gala by his other children Jordan (an established musician), Laura (a St. George's Elementary teacher) and Sara and his brothers Douglas and Ian. Anthony Wolfe, wife Reesa and the Officer cutout. “During my 21 years at St. George’s, I have met and been inspired by over 2,000 exceptional students, many of whom have made an impressive mark on the world, and most of whom speak fondly of their days at St. George’s,” said Officer. “ I have had the privilege of meeting and befriending their families and remain awed to this day with our parents’ level of engagement, their willingness to volunteer and their financial generosity. I have worked alongside eight different board chairs, each with their own strengths, styles and personalities, yet all of whom held firm to our school’s mission and values." Colleen Wicha, mother of St. George’s Grade 11 student Nicholas Wicha and dubbed “Lady Gala,” served as the chairperson of the Tribute Gala Committee, and worked with a dedicated team of parent volunteers and staff to plan this special evening. 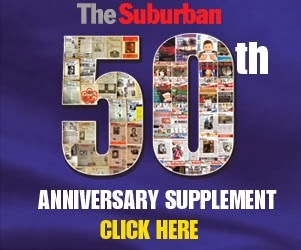 They included fundraising guru Don Belec, Kathay Carson, Howard Dolman, Jason Finucan, Pam Itzcovitch, Allyson Kassie Goldberg (class of '94), Patricia Klein (class of '88), Patricia Lavoie, Natalia Obando, François Prénovost, and incoming Board President Cheryl Weigensberg-Wood, who will succeed Louise Anne Poirier. Officer will be succeeded on July 1 by Sharon Klein, currently Deputy Head of Education at Queen Margaret’s School in Duncan, BC. A lifelong learner, she is passionate about education, has built a reputation for community building and is widely respected by her peers as a collaborative leader. Fully aligned with St. George’s vision and mission, Ms. Klein embraces inquiry and reflection in education. She is an advocate of progressive and research-based education, and is committed to whole-child approaches in rigorous learning environments. In addition to being a truly inspiring educator, Ms. Klein is an outstanding athlete. She strives to empower each individual student to become a passionate leader. The gala served as the launch for the James A. Officer Legacy 21 Campaign, which will enable the school to expand and renovate the learning spaces in the high school. St. George’s operates elementary and high schools about a mile apart from each other on The Boulevard. Already, $750,000 has been raised for this campaign towards a goal of $1.5 million. Allyson Kassie Goldberg, from the class of 1994 and a present-day parent, is chairing this initiative and working alongside Maureen and Jack Dym, Andrew Molson and Mirko Wicha The stunning Natalia Obando, the parent of a Grade 10 student, served as the emcee for the evening. A former Columbian teenage talk show host, her past experience in show business was quite evident as she moved the evening along nicely. Lewis noted how after a rigorous interview process Officer was hired. “With a tenure that lasted 21 years, St. George’s certainly had the stability, the leadership and the professionalism we were seeking,” she said. “From day one on the job, Jim lived and breathed the St. George’s philosophy. His dedication to the school was unwavering, his work ethic was incredible and he was a man of many abilities." Officer is an extremely personable individual. And while this evening had a Hollywood theme, the guest of honor really showed his acting chops in a hilarious video spoof on the motion picture Ferris Bueller’s Day Off. It began with Director of Student Life Daniel Boyer getting a call from a seemingly ill Officer, stating that he could not come to work. “He bought it,” Officer said to the camera. What followed were a series of sequences of him circulating around town on his bicyle and his car. Below is the actual video. Adam Greenberg, known to listeners of 925 The Beat FM as TB1, performed a special rap for Officer to the tune of Will Smith’s Fresh Prince of Bel Air classic. He was a graduate from the class of 2004. TB1 hosts his show on Friday and Saturday evenings and is a noted deejay. Later Lee Haberkorn, a 2002 grad, did a tribute of his own. Lee is currently the managing director of the St. James Theatre in Old Montreal, director of communications at the Rialto Theatre and the weekend producer for the Virgin Radio morning show. He shared an anecdote of how he once won a principal for a day contest and what a good sport Officer was. “I showed up in a full suit, ordered pizza for the school and skipped a few classes,” he said, noting that conversely Officer stepped into the role of a student. Hal Hannaford, the headmaster at rival Selwyn House, gave a very entertaining speech and spoke of his history with Officer at the level of the Canadian Accredited Independent Schools and the Quebec Association of Independent Schools. Ken Salomon, a 1964 grad of St. George’s and chairman of the board from 1989 to 1994, introduced the guest of honour. He was seated at table with many of his classmates from 50 years ago – a pretty smart idea for a high school reunion. What will Officer do in retirement. He speaks fondly of his farm, where he already spends a lot of time. For starters, he will oversee this summer’s activities of the hugely successful Explorations camp. The McGill program is moving from Royal Vale School to St. George’s. He will remain connected with St. George’s alumni affairs, their international programs and of course the Legacy 21 Campaign. When all was said and done, Officer helped form a congo line and danced with friends, family and colleagues to the tune of the Pharrell Williams hit song Happy. There was no Joe Cocker/Jennifer Warnes song. An Officer and a Gentleman indeed. Good luck Jim!